When Lighting Africa first began its operations in 2007 in Ghana and Kenya, awareness that solar lighting products could replace traditionally used off-grid lighting sources like kerosene lamps was very low – and trust in these products was even lower. That is why we embarked on a consumer education program to teach end-users about the benefits and proper usage of solar lighting and energy products – and how to identify quality lanterns. Good products alone cannot achieve the desired behavioral change: it must also be fostered through consumer awareness and education. Nana Asamoah Manu, Program Manager, Lighting Africa-Kenya. 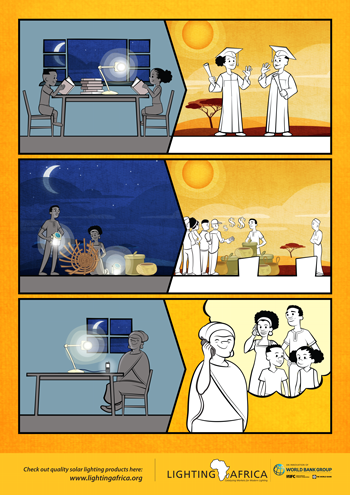 Since then, consumer education has been a cornerstone of every country program implemented by Lighting Africa. A recent joint WBG / Bloomberg New Energy Finance (BNEF) study found a strong correlation between the markets where off-grid solar is on a sharp growth trajectory and those where consumer education campaigns like ours were carried out. The report also shows that uptake of solar products is dramatically accelerated by consumer awareness, making sales cheaper, and easier, attracting more distributors, leading to more competition and lower prices – all underscoring the value of these consumer education campaigns. As the majority of the off-grid population lives – almost by definition – in remote rural areas that are difficult to reach with traditional ad campaigns, creative solutions are needed. 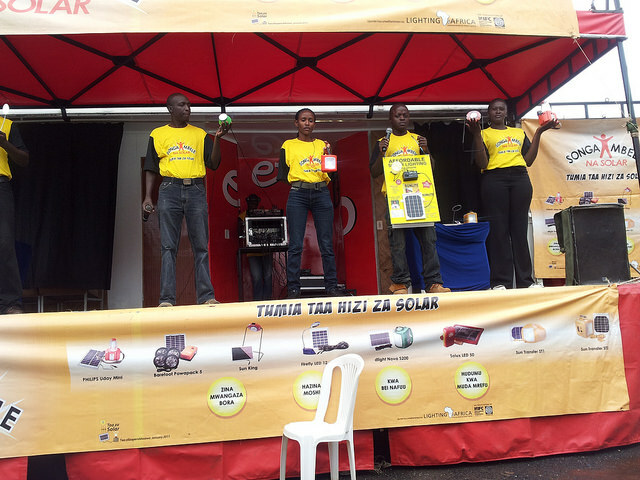 Travelling roadshows were among the first interventions conducted by Lighting Africa, and have been replicated in numerous markets. They enable direct communication with ‘last-mile’ consumers, allowing them to see and test products first-hand. Roadshows are a traveling ensemble of live music and dance performances, held on market days to reach the largest possible number of people. 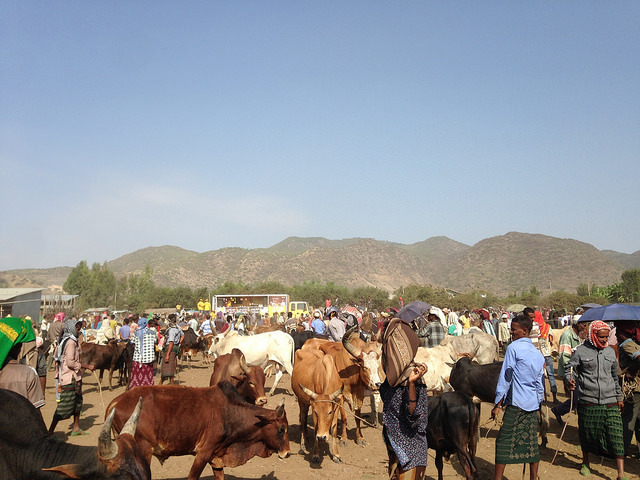 The show usually kicks off at sunset when most people are done with their day’s work, while the morning before is typically spent doing outreach in nearby villages announcing the event and inviting people to attend. In between performances facilitators will present a selection of solar lighting products, highlighting their benefits and demonstrating how they work. Consumers are then invited to test the products themselves, often in a dark room where the quality of the light can be experienced first-hand and compared against kerosene lamps and the like. Distributors and retailers are on hand to answer questions and sell their products. Lighting Africa has also developed a series of posters, radio-spots and TV ads that can be adapted to local audiences. 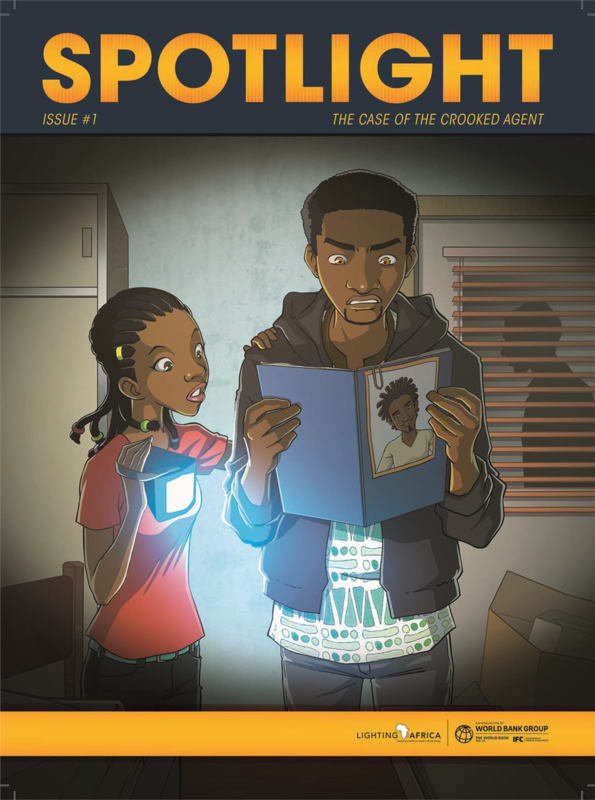 Most recently, we developed a comic book series called “Spotlight” that entertains young readers, while teaching them about the many uses and benefits of solar lighting products. Materials include posters, comic books, and videos. As awareness of solar lighting products as a superior alternative to kerosene lamps takes hold in many of the areas where we are active, we adapt our messaging to end-users accordingly. As in the case of ‘Spotlight’ the focus shifts from the singular message spreading awareness of solar lamps, and expands to promote knowledge of some of the additional energy services that the majority of these products provide such as mobile phone charging. Our market research activities ensure that we keep abreast of the knowledge consumers already possess and align the focus of our messaging accordingly.